Botanical Name: 1. Celosia argentea L.; 2. Celosia cristata L.
Part Used & Method for Pharmaceutical Preparations: The seeds are gathered in autumn when ripe and dried in the sun. Indications & Combinations: Flaring up of liver fire manifested as red, painful and swollen eyes, blurred vision and corneal opacity. 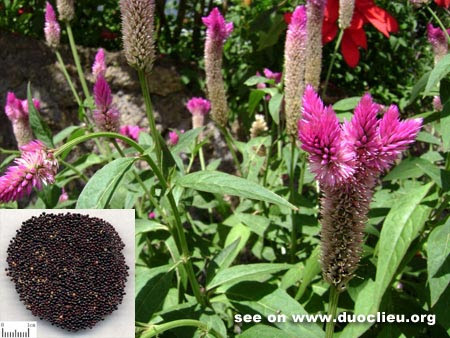 Celosia seed (Qingxiangzi) is used with Cassia seed (Juemingzi), Chrysanthemum flower (Juhua) and Plantain seed (Cheqianzi).